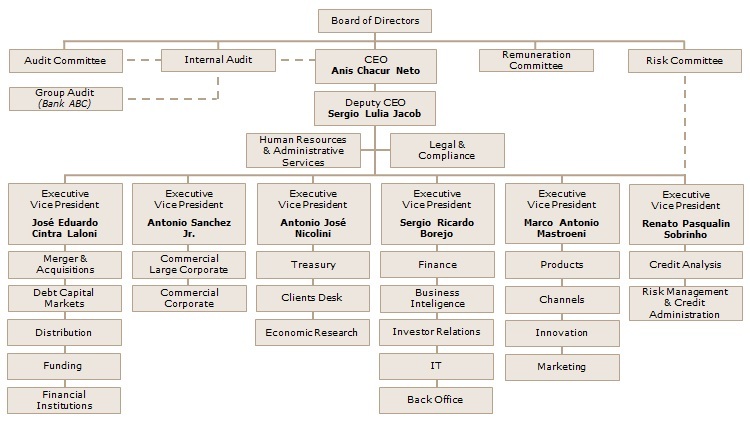 Banco ABC Brasil bylaws/articles state that its board of directors must consist of at least five and at most nine members, at least 20% of whom must be independent directors. The board currently has seven members, including three independent directors. Banco ABC Brasil’s board of directors is responsible for overall management of its business, including long-term strategy, control and monitoring performance. Among other duties, the Bank’s board of directors elects and replaces members of its board and supervises their performance. Members of the board of directors are elected by general meetings for two-year mandates and may be reelected. General meetings may also remove any member of the board at any time. Members of Banco ABC’s board of directors must be persons holding at least one share, whether or not they are resident in Brazil. The board’s risk committee is responsible for approving risk management policies and processes, reviewing and monitoring macroeconomic, legal, and regulatory environments, and focusing business impact and capitalization ratios. Anwar Ali Al Mudhaf.Graduated from University of California, USA and Peter F. Drucker School of Management at Claremont. Master’s and PhD in Finance. Formerly general manager at Kuwait Health Insurance Company and lecturer in corporate finance, investment management, and financial institutions at Kuwait University. Director and investment committee member at Kuwait Social Security Institute; vice-president of Al-Mal Kuwaiti (K.S.C.) and board member of Ahli United Bank, in Kuwait. Member of the board of governors and trustees at the Oxford Institute for Energy Studies; Former vice-president of International Bank of Asia Ltd. in Hong Kong, and former director of Arab Banking Corporation in Egypt (S.A.E.). Dr. Al-Mudhaf joined Banco ABC’s board in December 1999 and he has over 10 years experience in banking and finance. He also acted as a consultant to the Finance and Economic Affairs Committee of Kuwait’s Parliament. Currently chairman of the board of directors of Banco ABC Brasil. Tito Enrique da Silva Neto. Industrial Engineering degree from Universidade Pontifícia Católica (PUC) – São Paulo. Starting as an analyst with Banco Mercantil de São Paulo’s research department in 1968, has had a successful career and his last position before leaving was vice-president Operations. In 1983 he was elected CFO of Banco Banespa S.A. (state government bank), and subsequently vice-president general. In 1987, he became president of Banco Itamarati S.A., and remained there until 1991, when he was elected president of Banco ABC-Roma SA (now Banco ABC Brasil S.A.) remaining until 2010. Mr. da Silva Neto is currently vice-president of the board of directors of Banco ABC Brasil after stepping down as president. Vernon Handley. Law degree from the University of Durham (United Kingdom). Currently legal advisor to Arab Banking Corporation (B.S.C.) (“Bank ABC”), which he joined in March 2010. He is responsible for all legal affairs of Bank ABC and its subsidiaries and affiliates. Mr. Handley also acts as a director of several Bank ABC Group holding companies. Before joining ABC, he was legal adviser and senior vice president of Gulf International Bank. Since moving to the Middle East in 1995, Mr. Handley has worked mainly for banks and other financial institutions. Paul Henry Jennings. Multidisciplinary Mathematics, Economics and Commerce from the University of Oxford. Over 30 years of banking experience with financial institutions such as Lloyds Bank London, Arbuthnot Latham Bank, Mitsubishi Bank, Singer & Friedlander Ltd., and London Forfaiting Co. Joined ABC International Bank plc in September 1999 and is currently vice-president and director. Brendon Hopkins. Mr. Brendon Hopkins holds a degree in Mathematics from University of Birmingham and a MBA from Henley Management College. He is a UK qualified Chartered Accountant and Chartered Tax Advisor. He has more than 25 years of experience in financial services, having started his career at Deloitte and subsequently moving to Standard Chartered Bank in 1995 where he held a number of senior roles including CEO Europe and Group Head, Strategy, West. He joined Arab Banking Corporation (“Bank ABC”) in 2014 as Group Chief Financial Officer and is responsible for Bank ABC’s global Finance, Strategy, M&A, Balance Sheet Management, Taxation and Investor Relations activities. Ricardo Uchoa Alves de Lima.Holds a Bachelor’s Degree in Business Administration by Fundação Getúlio Vargas and an MBA Degree by University of Illinois (USA). Began his career at Comind S.A. Crédito Imobiliário as Financial Manager and has held executive positions at Metal Leve, Translor, Ultracargo and USS. In the public sector, has participated as Regional Action Coordinator in the Paulo Egydio Martins government, as Chief of Staff in the Government Secretariat in the Andre Franco Montoro government and as General Secretary of the Ministry of Industry and Trade in the 1985/1986 period. Was a member of the Board of Directors of Badesp, Fepasa, Embraer and Tempo. Currently is Consultant and member of the Board of Directors of several companies, including Banco ABC Brasil. The Bank’s officers are responsible for the everyday management of its business and for implementing policies and guidelines established by its board of directors. Banco ABC Brasil’s officers are elected by the board of directors for two-year mandates and may be reelected. Brazil’s Law of Corporations allows up to one-third of members of its board of directors to be elected to executive board positions. The Bank’s officers may be removed by its board of directors at any time. As required for the board of directors of Banco ABC Brasil since adhering to Level 2, new officers must sign the Directors Instrument of Consent assuming personal responsibility to submit to and act in accordance with the Level 2 adhesion agreement and regulations. Officers are also subject to Arbitration Rules in accordance with Banco ABC bylaws/articles. Anis Chacur Neto. Anis has been the CEO of Banco ABC Brasil since 2010, and has been a member of its Executive Committee since 1991, when he joined the bank. He has more than 32 years of experience in the financial sector, having occupied senior positions in different financial institutions. He is also Executive Vice President of ABBI (Brazilian Association of International Banks) and a Board Member of FEBRABAN (Brazilian Federation of Banks). Anis holds a Bachelor’s Degree from Fundação Armando Alvares Penteado, Brazil. Antonio José Nicolini. Nicolini is Executive Vice President of Banco ABC Brasil responsible for the Trading, Clients`s Desk and Economic Research areas, and is a member of its Executive Committee since 2019. Started his career at Banco ABC Brasil in 1991 and was the Director responsible for the trading area from 2009 to 2018. Has more than 25 years of experience in the financial market, specifically in Treasury and focusing on proprietary trading. He also performed as FX and fixed income trader, what held his way to undertake as Superintendent of Treasury department, being responsible for trading operations and management of proprietary positions on several markets. Member of ANBIMA’s Treasury Committee (Brazilian Association for Financial and Capital Markets’ Entities), Nicolini is graduated on Business Administration and owns a finance MBA from IBMEC/SP. Antonio Sanchez Junior. Economics degree from Universidade Federal do Rio de Janeiro. Over 20 years experience in banking, including management at Lloyds Bank Plc and at Banco Itaú BBA, where he was regional director from February 2010 to April 2013. Started his career at Banco ABC Brasil as Commercial Director responsible for the Large Corporate clients of the state of Rio de Janeiro. Currently, is Executive Vice President responsible for the Commercial areas of the Bank, and is a member of its Executive Committee since 2018. Jose Eduardo Cintra Laloni. José Eduardo is Executive Vice President of Banco ABC Brasil responsible for the Investment Banking, Funding and Financial Institutions areas, and is a member of its Executive Committee since 1991, when he joined the bank. He has over 30 years of experience in the banking sector, having worked in different financial institutions. He is also a Board Member of ABBC (Brazilian Association of Banks). José Eduardo holds a Bachelor’s Degree from Fundação Getúlio Vargas, Brazil. Renato Pasqualin Sobrinho. Renato is Executive Vice President of Banco ABC Brasil responsible for the Risk area, and is a member of its Executive Committee since 2011, when he joined the bank. He has over 30 years banking experience in relevant institutions such as Banco Safra, Banco ABN Amro, Banco General Motors do Brasil, BankBoston, and Banco Crefisul. He is also a Member of the Risk and Credit Environment Executive Committees of FEBRABAN (Brazilian Federation of Banks), besides having acted as Consultant to FEBRABAN and as Director of CED (Derivatives Exposure Center). Renato holds a Bachelor’s Degree from Fundação Getúlio Vargas, Brazil. Sergio Lulia Jacob. Sergio is Deputy CEO of Banco ABC Brasil. He joined the Bank in 1991, becoming a member of its Executive Committee in 1997. He has over 28 years of experience in the banking sector, serving in various senior capacities. Sergio is also a member of the Treasury Committee of FEBRABAN (Brazilian Federation of Banks) and of ANBIMA (Brazilian Association of Investments and Capital Markets). Sergio holds an MBA degree by the University of Michigan, USA. Sergio Ricardo Borejo. Sergio is Executive Vice President of Banco ABC Brasil responsible for Finance, Planning & MIS, Investor Relations, IT and Back Office, and is a member of its Executive Committee since 2007, when he joined the bank. He has over 22 years banking experience in relevant institutions such as BankBoston and Itaú, having worked also at Consultancy and Auditing Firm PriceWaterhouse & Coopers. Sergio holds a Bachelor’s Degree from University of São Paulo. Alexandre Yoshiaki Sinzato. Bachelor’s in Electrical Engineering from Polytechnic School, USP, post- graduate degree in Business Administration from Fundação Getúlio Vargas and Chartered Financial Analyst-CFA Institute. Philips Semiconductors Sales and Marketing (1999) and Banco Itaú’s Asset Management Custody (2000-2001). Joined Banco ABC Brasil SA in 2001 on the trading desk for International Arbitrage. In 2007 became head of Investor Relations and in 2014 assumed also the management of the Marketing area, being responsible for both areas until March, 2016. Since April 2016 he is the officer responsible for the Risk Management and Credit Administration area. Carlos Monaco Silva. Carlos is the Director responsible for the Trading Department of Banco ABC Brasil, since 2019. Joined the Bank in 2006 where actuated on Proprietary Positions as International Trades, Flow Desk Manager and Superintendent of Trading. He is graduated on Oceanic Engineering at University of São Paulo and is CFA (Chartered Financial Analyst) entitled. César Mindof. César Mindof is an Officer at Banco ABC Brasil, responsible for the Large Corporate sales area. He has 14 years of experience on banking and has already worked for many financial institutions, such as Santander, Itaú BBA and Pine. César holds a Bachelor’s Degree in Computer Science from ULBRA and a Post-graduation degree in Finance from Fundação Dom Cabral. Christian Max Finardi Squassoni. Holds a Bachelor’s Degree in Law from São Francisco – USP, and specialization in Corporate and Banking Law. With 20 years of experience in the banking area, he has worked as a lawyer in Brazil and abroad, holding positions in legal departments of various financial institutions, such as Unibanco, J.P. Morgan and Barclays. He also acts as Technical Director and Coordinator of the Legal Committee of ABBI – Brazilian Association of International Banks. He is currently the officer responsible for the Legal and Compliance areas of Banco ABC Brasil. Claudio Rodrigues Tibau. Business Administration degree from Faculdade Cândido Mendes (RJ), additional courses in finance, credit, capital market and business. Over 20 years of experience in banking, having started his career at Banco ABC Brasil in funding. Currently Institutional Funding officer. Daniel Credidio Brandão Barbosa de Oliveira. Daniel Credidio is an Officer at Banco ABC Brasil, responsible for the Corporate Commercial area. He joined the bank in 2011, being elected as an Officer in 2016 (pending of approval by the Central Bank of Brazil). He has 21 years of experience in commercial bank, having worked at relevant financial institutions such as Banco Safra, J. Safra, HSBC, Sudameris and ABC AMRO. Daniel holds a Bachelor’s Degree in Business Administration from Paulista University – UNIP. David Tadeu Panico. David Panico is an Officer at Banco ABC Brasil, responsible for the Mergers & Acquisitions are. He joined the bank in 2015, being elected as an Officer in 2016. He has 20 years of experience in Investment Banking, as part of relevant financial institutions such as Citigroup, Bank of America Merrill Lynch, Itaú BBA, UBS Investment Bank, Credit Suisse First Boston Garantia and Espírito Santo. David holds a Bachelor’s Degree in Industrial Engineering from University of São Paulo, and an MBA from Cornell University, USA. Edgard Toledo.Edgard is the Director responsible for ALM, Pricing and Liquidity Department. Started his carrier in the Bank in 2003 in the Credit Department and stood until 2007 when he moved to the Treasury. Worked on Pricing, Flow Desk and ALM where he took place as Superintendent in 2017 and Director in 2019. Edgard is graduated on Civil Engineering at the University of São Paulo. He is also post-graduated on Business Management at Getúlio Vargas Foundation and is CFA (Chartered Financial Analyst) entitled. Everthon Vieira. Everthon is head of Credit Analysis department and carries 10-year background in the financial market. Everthon worked primarily with fixed income instruments at Inter-American Development Bank, HSBC and Ernst Young with a focus on consultancy and structuring project finance operations for Latin America. He is graduated in Business Administration at EAESP-FGV and owns a MBA at G. Washington School of Business. He works at Banco ABC since December, 2017. Fernando Vasquez Fernandes. Fernando Vasquez Fernandes is an Officer at Banco ABC Brasil, responsible for the Corporate Commercial area. He joined the bank in 2012, being elected as an Officer in 2016. He has 20 years of experience in commercial bank, having worked at relevant financial institutions such as Banco Votorantim, Citibank, Banco BMC and BankBoston. Fernando holds a Bachelor’s Degree in Economics from UniSantana, and an MBA in Corporate Finance from FGV. Gustavo Henrique Tavares Silva Bellon. Holds a BSc Degree in Mechatronics Engineering by Polytechnic School of University of São Paulo and has 18 years of experience in the financial market, especially in the capital market. Started his career in 1997 at Citigroup, having also worked at ING and Itaú BBA, where has served in the last 10 years in the fixed income area, being responsible for the origination and execution of debt transactions in the Corporate, Middle and Financial Institutions segments. Joined Banco ABC Brasil in October 2014, where is responsible for the Debt Capital Markets area. João Carlos Benites Freneda. Economics degree – Universidade São Judas Tadeu. Formerly at Banco Mercantil de São Paulo S.A. (1981-1986) in Collection; Duratex S.A. (1986) financial investments desk; Engerauto Engenharia Ltda. (1986-1987) financial dept; Grupo Fenícia (1987) credit and collection; Banco Citibank S.A. (1987-1999 and 2006-2008) in Cost Control, Budget & Planning, Business Analysis and product manager, subsequently Corporate Banking and Corporate Finance-Strategic Planning. Formerly with BankBoston S.A. (1999-2006) in CIB Planning, Risk Officer, Client Services, MIS Revenues, and Banco Safra S.A. (2008-2010) Planning and Control advisory. With Banco ABC Brasil S.A. since 2010 in Business Intelligence, and currently officer responsible for Strategic Planning. José Álvaro Corbet Guimarães. Civil Engineering degree-FAAP. Formerly at Banco Itamarati S.A. (1989-1991) in credit and capital markets. With Banco ABC Brasil S.A. since 1994, and currently officer responsible for Corporate Client Relationship Management – Commercial Large Corporate – São Paulo. Leila Maria de Carvalho Rocha. Accounting degree from Universidade de Mogi das Cruzes, Executive MBA in Finance from IBMEC-Business School (Insper). Over 20 years of experience in accounting, starting career at Ernst&Young and with financial institutions including Banco de Investimentos CSFB Garantia, Banco Santander, and Banco Standard de Investimentos. Currently with Banco ABC Brasil as officer responsible for Accounting. Luiz Antonio de Assumpção Neto. Business Administration degree-Mackenzie/SP. Formerly at RAX Comercial e Artes Gráficas Ltda. (1994-1995) in its commercial dept; Marítima Seguros S.A. (1995-1996) in claims analysis. With Banco ABC Brasil S.A. since 1997, currently officer of Relations with Financial Institutions. Paulo Romagnoli. Civil Engineering degree – Escola Politécnica (USP). Formerly at Banco Crefisul (1982-1994) in corporate finance and credit analysis; Banco Arbi (1994-1995) in local and foreign currency products; BankBoston (1995-1999) in structured finance, securitization programs, structured prepayments, and tax planning; Banco Itaú BBA (1999-2010) in Products and Services. With Banco ABC Brasil S.A. since 2010, currently officer responsible for products. Ricardo Gentile Rocha. Holds a BSc Degree of Business Administration and Accountancy by University Paulista – UNIP, and a specialization in Finance by IBMEC São Paulo. With more than 20 years of experience in the financial markets, held different positions in several financial institutions, such as Banco Bradesco (from March 1994 to July 1999), Banco Boavista Interatlântico (from July 1999 to July 2000), Banco Santander Brasil (from July 2000 to March 2007 and from November 2008 to February 2014) and Banco Real ABN AMRO (from April 2007 to November 2008). Joined Banco ABC Brasil in March 2014, where is responsible by the pricing and distribution of Local Debt Capital Markets transactions. Rodrigo Montemor. Rodrigo holds a Bachelor´s degree in Business Administration from ESPM and a post-graduate degree in Finance from IBMEC-SP. He holds solid experience as a commercial management executive in financial institutions, having served in the commercial area of BankBoston (2004-2007), Banco Itaú (2007) and Banco Pine (2007-2017), in the latter as Executive Commercial Officer. Rodrigo joined Banco ABC Brasil in March, 2017 as the Officer responsible for the Commercial Large Corporate area. Rodrigo Sotero Galvão. Graduated in Economics by the Federal University of Rio de Janeiro. Rodrigo has more than 20 years of experience in financial institutions. He worked at Banco Pactual from 1996 to 1999, at Banco Votorantim from 1999 to 2013 and at Banco Safra from 2014 to 2018. Since the beginning of his carreers he has been working in commercial areas. At Banco ABC Brasil, he manages the Large Corporate department of Rio de Janeiro and reports to the Commercial Vice-Presidence. Valeria Fernandes da Silva. Holds a BSc Degree in Mechanical Production Engineering from Universidade Paulista, and an MBA in Human Resources from FIA/USP – University of São Paulo. With more than 20 years of experience in the human resources area, has worked at Banco ABN Amro Real from 1999 to 2009, at Even Construtora e Incorporadora from 2009 to 2011, and at BMG Financial Group from 2013 to 2014, among other companies, always in the human resources area. Joined Banco ABC Brasil in September 2014, where is responsible for the Human Resources, Marketing and Administrative Services areas. Waldecir dos Santos Junior. Computing Technology degree, major in Software Engineering and Systems Development from ITA. Business Administration postgraduate degree with specialization in Finance and Banking from Fundação Getúlio Vargas/SP. Formerly at Banco Santos S.A. (1999-2005), in IT. With Banco ABC Brasil S.A. since 2005, currently officer responsible for Technology.